"Sleek and elegant with graceful curves, this model is aerodynamically designed for speed and endurance. Capable of fast starts and quick stops, its double suspension chassis has a tight turning radius. They are quiet, require low to moderate maintenance, has good fuel-to-mileage ratio, and is available in a range of colors." Formerly known as the Russian Wolfhound, the Borzoi was built for speed and stamina to course wolves, hares, and other game on the harsh Russian plains. The Borzoi came to prominence because he could protect people and livestock from wolf depredation but he remained in favor as wolf hunting became a sport for royalty, full of pomp and pageantry. A lot tougher than he looks, the Borzoi is a tall, lean dog -- elegant and graceful in bearing. In overall structure, he resembles a Greyhound with long hair. His head is long and narrow with a barely perceptible "stop" at his eyes and small ears that lay against his head like rosettes. A large Borzoi may look coarse instead of elegant. The breed is deep-chested with a unique silhouette. Leg bones are bladed, not round, another aerodynamic feature to aid speed and endurance. The tail is long and well feathered and often is tucked between the legs when the dog stands. Feet are long and narrow, like rabbit-feet, and the pasterns (shock absorbers) are strong and flexible. The breed is well muscled with rear-end drive and good front and rear extension. The Borzoi is a gentle, loving companion and a quiet and well-behaved member of the household. Borzois enjoy the company of other dogs, preferably sighthounds or a larger dog that can keep up with them and usually do best if they are not the only dogs in the household. 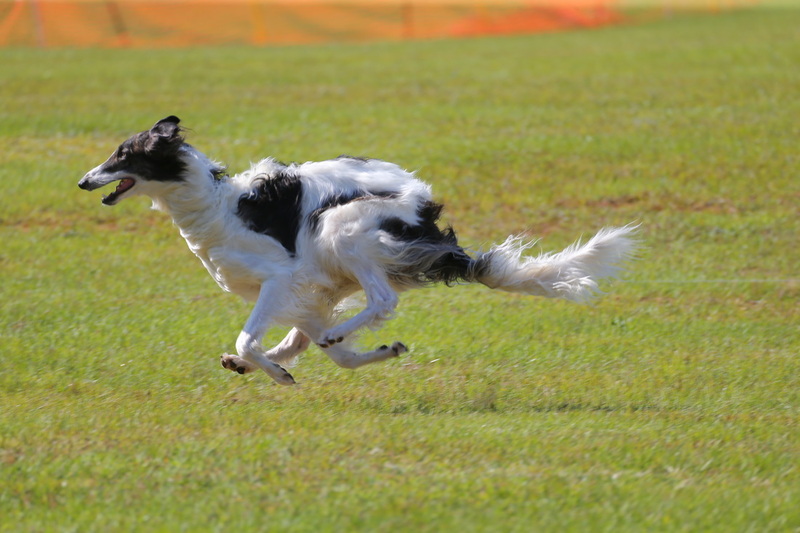 The Borzoi is intelligent, he does well in obedience; he learns the basics quickly but can just as quickly become bored with the repetition it takes to perfect a performance for competition. Since the Borzoi is built for running and is a very large breed of dog, he must have an area where he can exercise and stretch his legs to satisfy his need to gallop and keep him in good muscle tone. Without this opportunity, a young Borzoi will never develop properly. The Borzoi sheds his thick undercoat in the spring, followed by a minor shedding each fall. During these periods, a daily brushing helps prevent mats from forming and makes housework more manageable and a Borzoi will never turn down a good brushing. During the rest of the year, the dog should be brushed two or three times each week with special attention given to the feathering. Borzois will make an excellent companion for someone who would be willing to spend time with him or her, walk them, care for them and above all, love them.